Remove the burden of managing your technology needs. Titanium Technology Solutions can increase your productivity while providing cost-effective, managed services to make it easier for your company to focus on your business. Serving the central Florida and greater Orlando area, Titanium Technology Solutions specializes in small-business and residential technology solutions. With more than 20 years of combined experience in a broad range of IT services, we are here to provide a solution for any technology need. Our company has experience in a wide range of technology services and we have designed countless solutions for various clients. Just like we apply our process model to our client's solutions, we are always researching the latest industry trends and re-evaluating our services to keep up with continually changing technology! Titanium Technology Solutions has always stood behind the principal that business should be personal. Our staff will evaluate your needs and listen to your concerns every step of the way, and we'll continually evolve to your growing business. Not only do we bring cutting-edge industry insight to the table, but we also put our years of invaluable technology experience into every solution we design. We know everyone needs help sometimes. From corporations to residential clients and from long-term managed services to one-time consulting, we are here to help! Contact us today and a Technology Solutions Architect will design a solution to fit your needs! We've made managing your technology simple! Download our whitepaper and see how we can help your business grow! 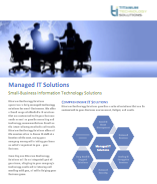 Fully managed Information Technology Solutions for your business. Contact Us!